There are many canards propagated by the vaccine deniers to support their personal beliefs (really, denialism) about the safety and effectiveness of vaccines. One of their more popular beliefs is that vaccines didn’t end many of the deadly diseases, but improved sanitation, healthcare, nutrition or magical fairies (also known as homeopathy) ended these diseases. There is even a subgroup of these believers who think that the CDC, historians, and everyone else is lying about the epidemics that existed prior to vaccinations–let’s call this group history deniers. They reject the scientific and historical evidence that vaccines saved lives – amazing. So, is there scientific evidence that vaccines actually ended these epidemics? Yes there is, and it’s unequivocal. Unless you want to embrace historical revisionism, and somehow all of the health care records and epidemiological information was faked, vaccines saved lives – lots of lives. All that needs to be taken out of this study are a couple of tables that illustrate effectively the reduction in morbidity (illness from the disease) and mortality (death from the disease) in the USA from the recent past (1940’s through 1960’s). Diphtheria. 100% reduction in cases and death. Measles. 99.9% reduction in cases and 100% reduction in deaths. Mumps. 97% reduction in cases, and 100% reduction in deaths. Rubella. 99.9% reduction in cases and 100% reduction in deaths. All vaccine-preventable diseases except for whooping cough (pertussis) and tetanus, vaccines dropped the death rate to 0. And in the two exceptions, the death rate was reduced by over 99%. And if you want to argue that better sanitation, you must think that we had bad sanitation in the 40’s, 50’s and 60’s. In fact, most modern sanitation systems date from that period of time (or even earlier). The germ theory of disease was well understood even in the mid 1800’s, and sanitation systems were already found in large cities and sanitation-related infectious diseases were well in decline. However, not all diseases are sanitation related, so it would be illogical to assume that sanitation was the major reason for reduction in these vaccine-preventable diseases. 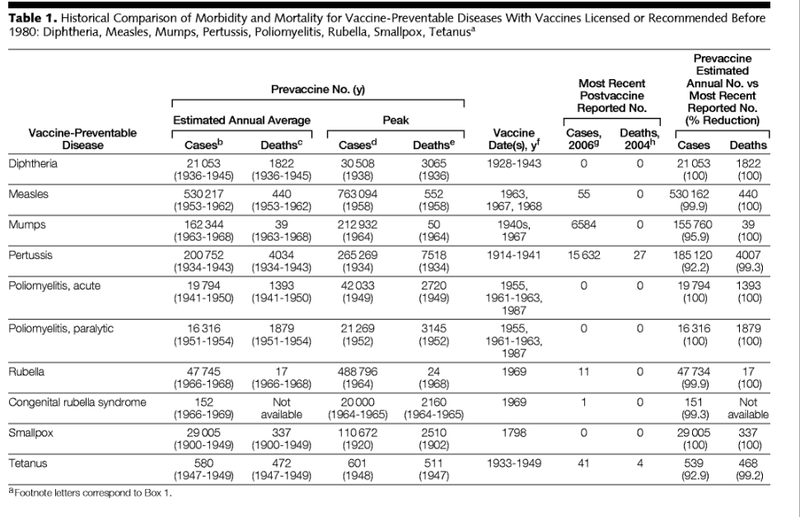 We can also look (Table 2) at vaccine preventable diseases of more recent history, using epidemiological statistics from the 1980’s, a period so recent that the differences between quality of sanitation, healthcare or other factors, at least with respect to infectious diseases, is not significant. Hepatitis A has dropped by 87%. Hepatitis B by over 80%. Hib (Haemophilus influenzae type b) has dropped by over 99%. Even varicella (chickenpox) has dropped by over 85%, despite only recently being added to the vaccine schedule. [infobox icon=”quote-left”]Vaccines are among the greatest achievements of biomedical science and public health, stimulating protective immune responses against acute and chronic infectious diseases, as well as some infectious diseases that result in cancer. In the United States, vaccination programs have made a major contribution to the elimination of many vaccine-preventable diseases and significantly reduced the incidence of others. Even today, with our modern sanitation (mostly) and modern healthcare (thank you Obamacare), there is overwhelming evidence that over 700,000 lives in the USA have been saved since a robust immunization effort began in the USA to cover all children. These data are not difficult to analyze. The morbidity and mortality rate for each of these diseases has dropped significantly (often to 0) in the 50-60 years since vaccines were introduced to the American public. Thousands of lives were saved every year. Millions saved since the 1940’s. The cultural memory of the horrifying experiences of these diseases has been lost. Maybe that’s why it’s so easy to ignore the historical facts. But there is just massive amounts of evidence that vaccines saved lives – some people can’t help but deny it. Editor’s note: This article was originally published in September 2013. It has been completely revised and updated to include more comprehensive information, to improve readability and to add current research. Roush SW, Murphy TV; Vaccine-Preventable Disease Table Working Group. 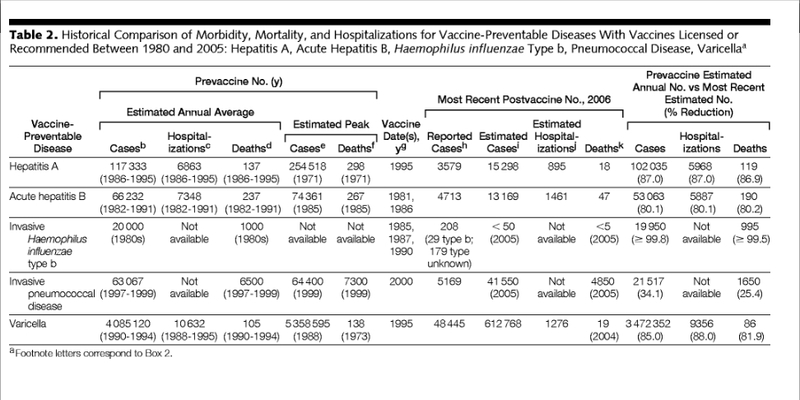 Historical comparisons of morbidity and mortality for vaccine-preventable diseases in the United States. JAMA. 2007 Nov 14;298(18):2155-63. PubMed PMID: 18000199.